The Galápagos Marine Reserve (GMR) lies a thousand kilometres from the Ecuadorian mainland and covers an area of around 133,000 km2 (51,000 sq mi). The Galápagos Islands and the surrounding waters represent one of the world’s most unusual ecosystems and are rich areas of biodiversity. Recently granted UNESCO World Heritage Site status, the Galápagos Marine Reserve is the largest marine reserve in a developing country and the second largest reserve in the world. From the plane of an Airbus A320, flying out Baltra Island (on the right) and Santa Cruz Island (on the left) and between the two islands is the Itabaca Channel an area filled with water taxis taking people in between and to waiting boats off shore waiting for multi day cruises. Coastal lakes, moist soil and areas where freshwater and seawater mix contain unique species still to be studied. Cold, hot and warm marine currents come together here, generating a wide diversity of animal life: from small coloured fish to large mammals. ; marine iguanas, Galapagos Land Iguana, galapagos crabs, Galápagos sea lion, Sharks, Blue footed boobie, swallow-tailed gulls, ducks, frigatebirds and the galápagos tortoise. The most unique species to the Galápagos is the Marine Iguana, due to its amphibious nature. It is the only known reptilian lizard that can forage in water and on land. 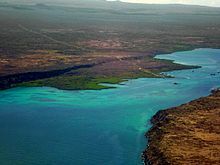 The Galápagos Marine Reserve faces a number of environmental threats. The most pressing threats to the GMR come from over-fishing and illegal fishing. Some animals are always illegal to hunt in the Galápagos. The legal local sea cucumber and lobster fisheries are heavily depleted and may be close to collapse. This poses dire consequences for the oversubscribed fishing sector in Galápagos, likely causing local fishermen to turn increasingly to illegal practices, such as shark finning, overfishing of tuna, and illegal export of sea cucumbers. Non-native species, such as cats and dogs, have also began to pose a major threat to the fragile ecosystem found in the GMR. Pollution and development pose an additional threat to both terrestrial and marine wildlife. The concurrent growth of the tourism industry and local populations means this problem will certainly increase. The population of Galápagos is growing at a rate of approximately 6% per year, more than double population growth of mainland Ecuador.The grounding of the tanker Jessica, delivering bunker fuel and diesel for tourist boats and the Ecuadorian Navy, brought world attention to the marine threats from increased human activities on the Islands. Many international conservation and science organizations are working to protect the Galápagos Marine Reserve. Among them are the Charles Darwin Foundation and WildAid, which is working to improve the capacity of the Parque Nacional de Galápagos staff to protect the reserve from overfishing and other threats. The Sea Shepherd Conservation Society also maintains an office in Puerto Ayora, on the island of Santa Cruz. ^ "Aspundir: 10 Largest Protected Areas in the World". Retrieved 26 June 2012. ^ "Federacion Hotelera del Ecuador". Hoteles Ecuador. Retrieved 26 June 2012. ^ Society, National Geographic (2011-01-29). "Case Study: Galapagos Marine Reserve". National Geographic Society. Retrieved 2016-10-24. ^ Carr, Lindsey A; Stier, Adrian C; Fietz, Katharina; Montero, Ignacio; Gallagher, Austin J; Bruno, John F (2013). "Illegal shark fishing in the Galapagos marine reserve" (PDF). Marine Policy. 39: 317–321. doi:10.1016/j.marpol.2012.12.005. Retrieved 2013-03-12.